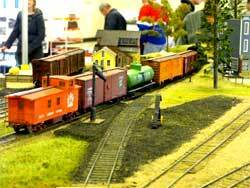 The annual one-day Copetown Train Show was held February, 22, 2009. Copetown is near Hamilton, Ontario. 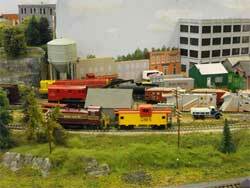 The show is sponsored by the Canadian Association of Railway Modellers (CARM) and focuses on Canadian prototypes and models. 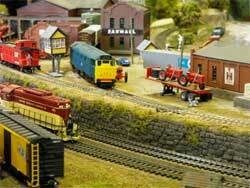 There were two model railways on display, the S Scale workshops modules and the traveling layout of the Dundas Modular Railway Club. There were also a number of Canadian dealers and manufacturers on hand. The new Rapido Turbotrain was on display. I used to ride this train between Montreal and Toronto. 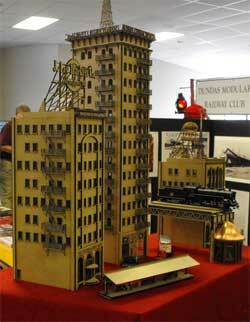 There was also a new manufacturer, "Imagine That", displaying some amazing laser cut buildings in HO scale. I've included some photos below. Here is a video of the two train layouts. 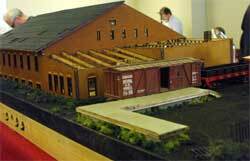 The S scale workshop had a set of point-to-point modules with sound-equipped steam engines operating. 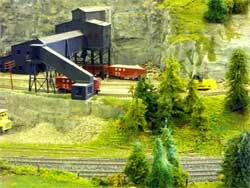 The Dundas club was formed in 1992 and planned to build a modular layout. They ended up building a sectional layout that can be set up in several configurations, 14 by 30 feet or 14 by 14 feet. 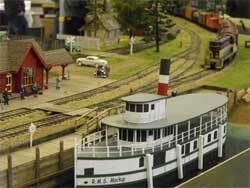 The smaller configuration of the Dundas and Mineral Springs Railway was set up at this show. This railway uses Atlas code 100 flextrack with Peco turnouts. 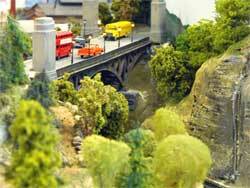 The mainline is approximately 88 feet and the branchline is 84 feet. Power is by Prodigy wireless DCC and Aristocraft wireless DC throttles. Have a look at some video clips I took with my camera on movie setting. 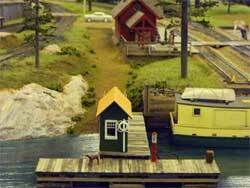 The first several pictures are of models that were displayed: A grain loading dock, and a Canadian Pacific station that resided in British Columbia. Click on the thumbnails for a larger view. 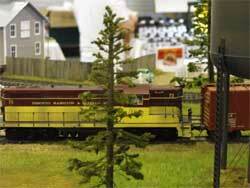 Here is an excellent model of a passenger car and a Canadian National engine with a steam generator car. It actually produced steam although you can't see it in the photo. 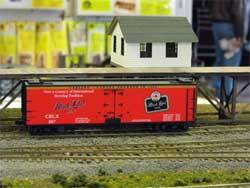 This is the famous CN Turbotrain, now produced in HO scale by Rapido Trains. 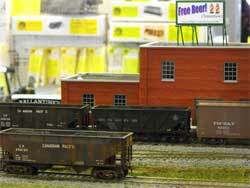 The next set of pictures are of the laser cut building kits by "Imagine That", a new company displaying work for the first time at the Copetown Train Show. 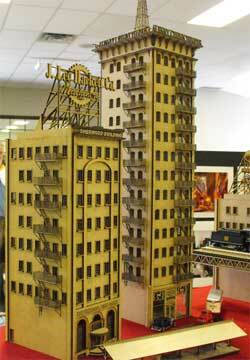 The models included the Chicago "L" girder kits, Walkerville wagon works and some skyscrapers. (If you're interested, go to imaginethat@xplornet.com). 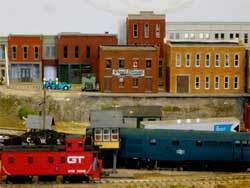 The next set of pictures are of the laser cut building kits by "Imagine That", a new company displaying work for the first time at the Copetown Train Show. 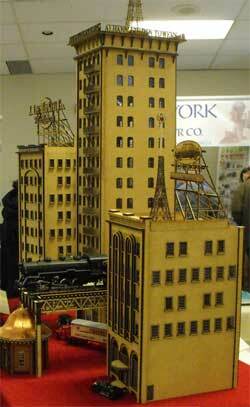 The models included the Chicago "L" girder kits, Walkerville wagon works and some skyscrapers. (If you're interested, go to imaginethat@xplornet.com). Here are photos of the Walkerville Wagon Works, alleged to be an early Ford Motor Company automobile assembly plant. 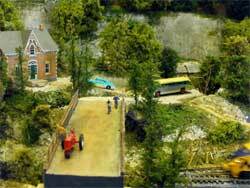 There are lots of pictures of train layouts if you go to my Photo Gallery. Lots of inspiration for modelling! Return from "train-layouts" to the Train Photos overview. Return from "train-layouts" to my Home Page.